Since it first landed on Mars in 2012, NASA’s Curiosity rover has made major discoveries in search for life on the surface of Earth’s next-door neighbor. But seemingly not to be outdone by the historic Mars InSight probe landing, Curiosity recently made an intriguing find. The Curiosity team posted an update to its mission blog last week, revealing a shiny lump found sitting on the surface of the otherwise dusty planet’s surface. They’ve nicknamed the mysterious, lustrous object “Little Colonsay.” The rover snapped a close-up of the object with its ChemCam on Monday. Curiosity’s ChemCam includes a camera, spectrographs, and a laser capable of helping NASA analyze the composition of rocks and soil from other planets. The rover hasn’t yet begun its investigation into Little Colonsay, but is scheduled to do so soon. 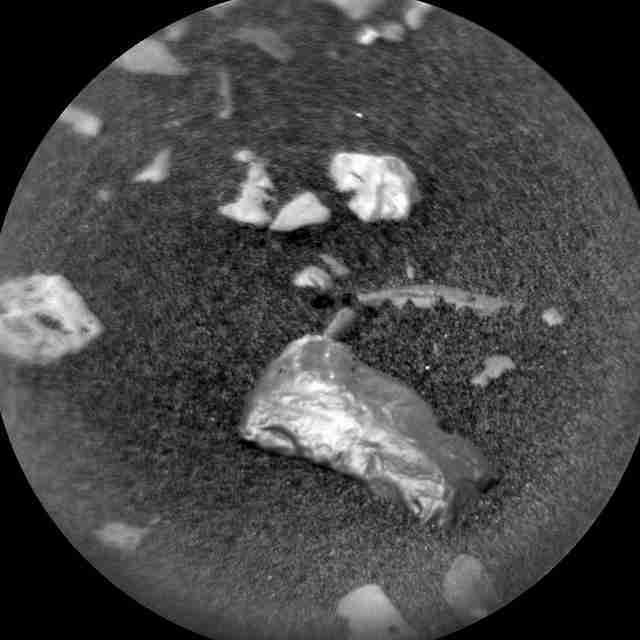 Members of the Curiosity team hope to be able to determine whether the shiny Martian object is a meteorite or something more. This isn’t the first shiny object NASA’s come across on Mars, but the Curiosity team is hopeful that this discovery will provide them with insight into life on the red planet. Earlier this year, they came across a flake-like object that turned out to be a piece of Martian rock, but not all their findings have been fruitful. 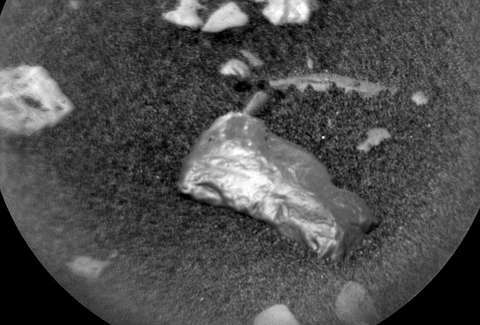 In 2012 Curiosity came across a strange glimmering object that turned out to be nothing more than a plastic part of the rover. Whoops! Don’t lose faith in the Curiosity rover’s abilities, though. The vehicle came across a jumbo specimen in 2014 and its predecessor, NASA’s Opportunity rover, uncovered an iron meteorite on Mars way back in 2008. It was the first time a meteorite of any kind had been discovered on another planet, which is a pretty big deal. In the meantime, us earthlings will just have to wait and see what Little Colonsay turns out to be.